The UK Sound 1173 is the latest product to come from BAE the makers of the excellent vintage re-issue range of EQs, Mic Pres and compressors. The 1173 is basically 2 units in one combining the vintage mic pres of a 1073 with the compressor of the classic 1176. More bounce for the ounce. The UK Sound 1173 is the result of a design collaboration between Los Angeles-based producer Warren Huart and gear designer Michael Stucker, produced and manufactured by UK Sound. The UK Sound 1173 brings the best of both worlds into a single unit, offering a Neve style 1073 preamp and Universal Audio 1176 FET compressor. The 1073 has been a go-to preamp to many engineers for decades because of it’s ability to add clarity and punch to any source you run through it. An ideal choice for drums, percussion, bass, electric guitar, acoustic instruments and vocals. 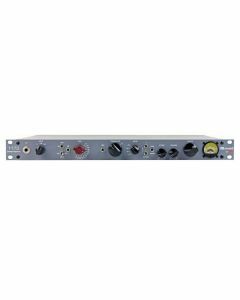 The preamp allows you to choose between three different input types, DI, Line or Mic. Adjust the gain with the 12 step attenuator in 5 dB intervals for easy recallability. The front panel includes a dedicated DI input, phase flip switch and the ability to engage phantom. Choose between High and Low impedance depending on the style of mic you choose or to simply change how the microphone responds to the preamp. Engage the high pass filter to clear out any rumble or mud from the bottom end of the signal, then use the preamp output control to send the perfect level to your A/D converter or tape machine. The compressor channel works similarly to a classic 1176, with the ability to adjust attack and release. Choose between four selectable ratio controls and adjust the output to the A/D converter or tape machine. It features the recognisable FET compressor controls for input and output gain and the time-honoured compression ratio options of 4:1, 8:1, 12:1, and 20:1. The "preamp out" works as the input to the compressor rather than having a dedicated INPUT knob. The 1173 has a side chain filter in the compressor section allowing lower frequencies to pass through without engaging the compression. Engage the true bypass switch to compare the signal pre and post-compression. The "!" switch engages the "all buttons in" setting commonly found on a classic 1176 too adds layers of excitement and depth to the signal. As with BAE Audio, all UK Sound products are built in California with carefully chosen components. BAE Audio's longstanding tradition of building vintage circuits makes Loughman and his team uniquely qualified to bring UK Sound to life as a company that applies that expertise in new and unique ways. The 1173 is has an all-discrete and Class A signal path with transformer balanced input and output. Separate Mic, Line, and DI inputs allow this unit to be a part of any recording that you do.